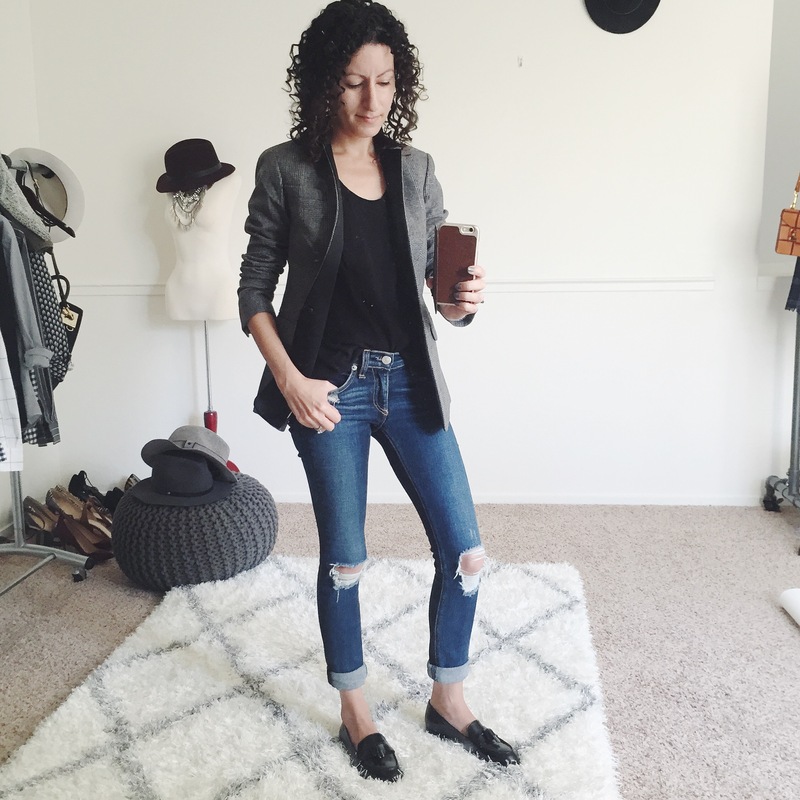 These cardigans caused a petite buying frenzy after this item review in the Alterations Needed Forum. These cardis are on sale at J.Crew, and when coupled with the promo code MUSTHAVE, come to a mere $21! This promo code ends tonight, so if you want to pick these up, do it now! The wool skirt I’m wearing is also on sale. These cardigans are nice and slim in the arms, which I’ve found to be important for petite fit. Baggy arms make us look frumpy! They have a fun silk chiffon trim that makes its way all along the button placket and neckline, and come in the usual beautiful colors that J.Crew does so well. Seriously…I think J.Crew has some of the best colors ever. 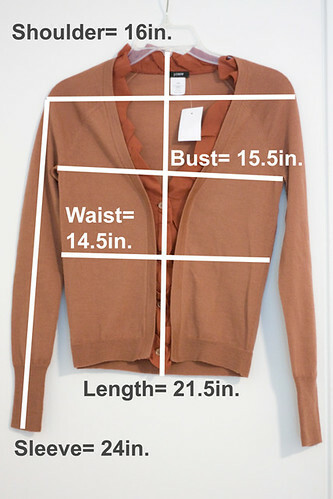 Oh J.Crew…why won’t you make your lovely cardigans in petite? Or at least stop vanity sizing so I can shop like mad in your stores? Even though this detail is in the name of the cardigan, I was surprised to see this…the button placket is actually silk chiffon! I like this detail, as it gives the sweater great dimension. I also like this sweater open, but belted. This still creates my favorite “X” shape on my torso, but also helps to rein in the extra fabric. See how the belt helps control the extra fabric from behind? These would be amazing if the torso were a bit slimmer, but are still really cute, and for $21 a piece, I’m keeping them. I think they’ll also look great layered under jackets, and those colors are just too amazing not to add to my wardrobe. If you’re as petite as I am, or even smaller, expect some bagginess in this cardigan, but ladies a size or more up could find a nice fit. One complaint I was reading on Twitter was the slim arms were actually a bit tight on some ladies, while the torso was still baggy, so beware. Be sure to check out the review of this cardigan by Extra Petite, and keep an eye out for more reviews from other bloggers soon. Anyone else pick up this J.Crew cardigan? What are your thoughts? Are you keeping it? These are quite baggy on you…the LOFT ruffled ones fit a lot better on your torso in comparison. The color is the only reason I'm keeping my weathered wood. I was originally going to hunt down Vicky's XXS in gold but the shape and bagginess is holding me back from keeping two. $21 is still $21 and who knows they will probably have better ones next season! I emailed them asking them to add XXS and 00P to the sort by size feature for sale items. That would save soo much time if they add it in…right now we have to browse aimlessly for sale items that are available in those sizes. I like how the XXS fits on you, I am probably returning the blue that I ordered because the sleeves were rather tight on me. I like the belted look a lot! Hmmm, I passed on getting these cardigans because I wasn't sure of the colors. =P Unlike you, I'm a little iffy on some of J. Crew's colors — but the gold looks gorgeous on you! and I like the fit! A little loose but still really fitted; and the button detailing is super cute! J.Crew cardigans don't fit me very well, but I haven't tried theme in XXS yet. As for the skirt – how many of them do you have? the gold one is super cute on you and a great fit when buttoned. not a bad steal! I am glad I'm not the only one who has noticed J Crew's cardis fit slender in the arms but proportionally are wider in the torso that I think they should be. I still think the fit for this pretty cardi is good on you though – and I love how you paired it! @PetiteAsianGirl – Yeah, the weathered wood color pleasantly surprised me. I was excited for the gold, but I might like the weathered wood better. Glad you emailed about the search…I agree! So frustrating! LOFT & AT's search drives me nuts too. @curls-and-pearls – You poor thing! I would be so upset if I couldn't wear wool! @Elle – Yeah, the sleeves are really fitted, which is good in my case because along with scrawny legs, I also have scrawny arms! But definately a problem for anyone with strong arms. @Jeni – LOL…color is very personal thing, because what looks great on one person will make another person look sickly and washed out. I find J.Crew colors to work pretty well with my skintone, so I love them. As long as I keep the cardis either buttoned or belted, they actually look pretty cute. @CynthiaC – I have the wool bell skirt in henna, and now black. I found the black on sale in a J.Crew store a little while ago. @April – Thanks! The belt really helps to rein in that extra torso fabric. @Lisa – respect the shoes – Ahh…so it's just a J.Crew thing huh? I don't usually order J.Crew stuff, so the fitted arms/wide torso was surprising to me. Too bad about the bagginess. But the colors are beautiful and would probably look great for layering, especially with the buttons being on the ruffles. I'm returning the Weathered Wood in XXS that I ordered but I did place another order for several other tops in the same color. Such a beautiful shade! I wish J. Crew would offer more sales and especially free shipping since their sizing varies. Even though it's baggy, I still think it's so pretty and feminine and you look super nice in it! I got so many diff colors as well as the Merino Cielo which is similar but the buttons are a bit different. It looks great from the front, but I don't think the back bagginess is horrible. Not sure if you like wearing your cardis tucked in, but I think that may hide some of the excess fabric. The gold color is sooo pretty though. I think it's my favorite color this season! @R – Weathered Wood is such a beautiful color! Glad to hear you picked up a few more items in it. More free shipping would be great, especially since sizing is so inconsistent and unpredictable! @Really Petite – I'm not surprised it fits you better at all, since you're a bit bigger than me. I also got the Cielo cardigan, but it's still in the mail. I'm assuming it has a similar fit, so it might go back if the color isn't fantastic. @Cee – I know! That gold/marigold/mustard color is so beautiful in fall/winter. I love it! What a deal!! And you chose great colors!! Of course I ordered this cardigan as well. How could I not after seeing Jean's reveiw. The "X" shape was my favorite too and I see we have the same taste in colors ;) Btw, I love this entire outift, it's so adorable. I saw in the comments that Jean e-mailed Jcrew and asked them to add our sizes to their sorting feature….Thank you Jean! i think from the back unbelted it looks baggy, but with a belt it looks fine. and $21 what a steal!? and i agree with you–jcrew does have the best colors! 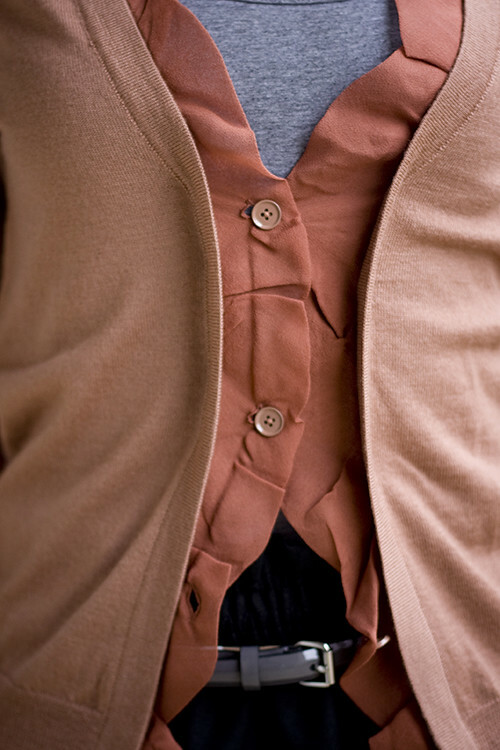 the cardigan is a little bit baggy on you, but it looks really nice belted. the weathered wood color is really gorgeous and for $21, it's a great deal. i got my gold one today and the sleeves are a bit tight on me. i'll have to see what i can make with it! Kelly, I really really like both cardigans on you. The color is fantastic. (I agree with you on Jcrew colors, that and its quality is what keeps me hooked.) I am smiling at your pictures when I see how loose the arms are on you. When I put it on, the fabric does not have any room to move. LOL. I ordered some xs hoping to compensate for the tight arms, but turns out xs is WAY too big. Now I'm stuck with 3 xs and 2 xxs cardis in my hand. :) I might keep one xxs because I really love the color and the chiffon front, the xs all have to go back to the store. I love it. I picked up the Cielo Ruffle Cardigan, which is similar but doesn't button on the trim, because I really liked the Heather Caramel color. They're also running small and are on sale, but right now only the black is left in XXS. @Anh – Thanks! Loving all the outfits you've been putting together too! @Callandra – Oh good! I'm interested to see how they fit on you too! Those colors were popular! @kileen – Oh no! The sleeves are tight on you too? I hope you can figure something out. Maybe they'll stretch after a wear? @Vicky – The xxs looked so nice on you in your Twitter pics! I hope you can make one work! I got all the cardigans in XXS but none fit me — they are all long from armpit to shoulder, and too snug in the arms — so they're going back to the store. Besides the chiffon placket cardis, I do also have the aforementioned Merino Cielo in a lovely pale pink — would someone prefer to buy it from me vs my returning it? I got it for like $19. Ping me on Twitter if so? This is so cute on you – I love both colors!